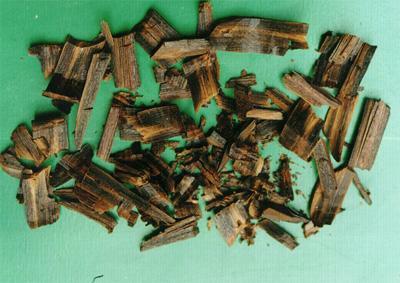 The resinous wood of Aquilaria agallocha Roxb. or A. sinensis (Lour.) Gilg. of family Thymelaeaceae. Aquilaria agallocha Roxb. is mainly produced in Southwest Asia and India; A. sinensis (Lour.) Gilg. is mainly produced in Hainan, Guangdong, Taiwan provinces in China. Pungent, bitter, warm; spleen, stomach and kidney meridians entered. Move qi and alleviate pain, warm middle energizer and arrest vomiting, improve qi reception and relieve dyspnea. It has the actions of moving qi and dispersing cold to alleviate pain and is indicated for any kind of syndrome of congealing cold and qi stagnation. For distending pain in chest and abdomen due to congealing cold and qi stagnation, it is usually combined with the middle-energizer-warming and qi-moving herbs to alleviate pain. For instance it is combined with Wu Yao, Mu Xiang and Bing Lang in Chen Xiang Si Mo Tang from Wei Sheng Jia Bao. For gastric and abdominal cold pain due to deficiency-cold of spleen and stomach, it should be combined with the middle-energizer-warming and yang-reinforcing herbs. For instance it is combined with Gan Jiang, Rou Gui and Fu Zi in Chen Xiang Gui Fu Wan from Wei Sheng Bao Jian. For congealing cold in viscera due to qi deficiency of middle-energizer manifested as heart and abdomen pain and loose stool, it is usually combined with the middle-energizer-tonifying and qi-reinforcing herbs. For instance it is combined with Ren Shen and Bai Zhu in Chen Xiang Wen Wei Wan from Nei Wai Shang Bian Huo Lun. It can not only warm middle energizer and dispel cold but also check adverse rise of qi to arrest vomiting. For vomiting due to invasion of stomach by cold, it is usually combined with the middle-energizer-warming and vomiting-arresting herbs. For instance it is combined with Hu Jiao, Bi Cheng Qie and Chen Pi in Chen Xiang Tang from Sheng Ji Zong Lu. For chronic vomiting and hiccup due to deficiency-cold of spleen and stomach, it is usually combined with the spleen-invigorating, middle-energizer-warming and vomiting-arresting herbs such as Ren Shen, Ding Xiang and Bai Dou Kou. It can not only warm kidney and improve qi reception but also check adverse rise of qi to stop dyspnea, so it is indicated for deficiency of kidney yang and failure of kidney to receive qi. It is usually combined with the herbs of warming kidney and reinforcing yang, and improving qi reception and relieving dyspnea. For instance it is combined with Rou Gui, Fu Zi and Bu Gu Zhi, in Hei Xi Dan from Tai Ping Hui Min He Ji Ju Fang. For cough and dyspnea due to the syndromes of phlegm-fluid retention and upper excess and lower deficiency, it should be combined with the herbs of resolving sputum and stopping cough, ventilating lung and relieving dyspnea. For instance it is combined with Su Zi, Qian Hu, Ban Xia and Hou Po in Su Zi Jiang Qi Tang from Tai Ping Hui Min He Ji Ju Fang. Decoct 1~3 g. It should be decocted later; or pounded into juice or 0.5~1g powder for oral use.